This training manual is designed to be used in conjunction with the "Homeowners and renters insurance: What you need to know before and after a natural disaster" and "FEMA spells federal disaster relief for homeowners and renters" fact sheets (brochures). There is also a lesson plan and PowerPoint presentation for use by consumer education trainers. Why do I need homeowners or renters insurance? Almost two-thirds of U.S. residents live in areas where there is a moderate to very high risk of a natural disaster—tornadoes, hurricanes, hail, wildfires, floods and earthquakes (https://www.attomdata.com/news/risk/2017-u-s-natural-hazard-housing-risk-index/). In fact, extreme weather events caused a total of $306 billion in damage in the U.S. in 2017, making it the most expensive year on record for natural disasters in this country, according to the National Oceanic and Atmospheric Administration. While insuring your home and belongings won't help you avoid any of these disasters, it will help you recover from them. Even if you don't have a lot of valuable possessions that would need replacing after a disaster, insurance is vital because, in many cases, it covers the costs of being temporarily displaced due to destruction of or severe damage to your home. Millions of Americans living in areas where disaster struck were displaced in 2017. What is "additional living expenses" coverage? Coverage for "additional living expenses," or loss of use, pays for the extra costs of living elsewhere while your home is uninhabitable. Those expenses can include rent, hotel bills, restaurant meals, storage fees and more. However, the coverage only kicks in if the cause of the displacement is covered in your policy. For example, a standard homeowners or renters policy doesn't cover flood damage, so it would not provide additional living expenses coverage if your home were uninhabitable just because of a flood. If, however, the home became uninhabitable because a tree fell on it due to wind, and wind damage is included in your policy, you would be covered. The key is understanding your policy—what is included and excluded—and making sure you have adequate coverage. Learn more about coverage that pays for additional living expenses at Insurance.com. Read NerdWallet's "Understanding Homeowners Insurance" for an overview of insurance for homeowners and renters. How much does "additional living expenses" coverage typically pay? Approximately 30 percent of the personal property or contents limit on a standard renters policy. For example, if your home is insured for $300,000, and the limit for additional living expenses on your policy is 30 percent, then you would be allowed up to $90,000 to spend on hotel bills, rent, etc. There usually is a time limit for using the coverage. In California, policyholders get at least 24 months to spend additional living expenses coverage, but other states set lower limits (12 months, in many cases). As always, read your policy to learn exactly what your coverage provides (what types of situations are covered, the dollar limit of the coverage and how long you have to use it). Talk to your agent about options for increasing your coverage if necessary. United Policyholders offers information and tips regarding additional living expensed coverage. What is the difference between homeowners and condominium insurance? Note: In this and related publications, references to "homeowners insurance" generally include condo and other types of building insurance. Do I need insurance for specific types of natural disasters? Landslide, which requires separate coverage, even if you have an earthquake policy (https://www.iii.org/article/insurance-for-landslides-and-mudflow). Sinkhole, which is offered in some states, either as an endorsement to an existing property insurance policy or as standalone coverage (https://www.iii.org/article/sinkholes-and-insurance). "Difference in Conditions" policies, which offer all-in-one coverage for a variety of risks (all or some combination of landslide, mudflow, earthquake and flood), are sold by surplus lines insurers (companies that insure against risks not covered by standard insurance carriers). If you're interested, ask your insurance agent for help finding such an insurer. Not everyone needs to insure against every risk. Conduct a risk/cost analysis to decide if the risk justifies the premiums. Your real estate agent can help you, but bear in mind that s/he is motivated to sell you coverage. If you live in a flood zone and have a mortgage, your lender most likely requires flood insurance. Even if you don't have a mortgage, aren't required to carry flood insurance or are a renter, you might want to consider the coverage; FEMA's records show that 25 percent of all flood losses are suffered by homeowners with a low flood risk. To find out the flood risk level where you live, visit FEMA's Flood Map Service Center and type in your address. Why can't I just rely on FEMA to reimburse my losses after a flood? With a limit of $34,000, FEMA disaster grants may be insufficient to repair or rebuild your home. Even with limits of $40,000 to repair or replace personal property and $200,000 to repair or restore your primary residence to its pre-disaster condition, low-interest loans through the U.S. Small Business Administration (SBA) may also be insufficient. And, of course, they must be repaid, making your financial recovery more difficult. You can't buy flood insurance directly from the National Flood Insurance Program—it has to be purchased through an insurance agent. Check first with the insurer that provides your homeowners or renters insurance. If it doesn't sell flood insurance, you can ask for referrals from friends and neighbors, or call the NFIP Referral Call Center (800-427-4661) to request an agent referral. Learn more at the NFIP "How Do I Buy Flood Insurance" webpage. NFIP flood insurance is only available in participating communities, but most communities do participate. Your agent can tell you if your state and community participate, or you can look it up online in the Community Status Book. If NFIP flood insurance isn't available in your community, you can look for a Private Market Flood policy. Ask your insurance agent about availability or a referral. There are many variables taken into account when pricing flood (or other types) of insurance. The average premium under the National Flood Insurance Program is close to $900 per year for homeowners, but rates can vary widely, from a couple of hundred dollars per year to thousands. There is even a low-cost policy for homes in moderate-to-low-risk areas. Your rate will depend on your deductible, the amount of coverage, the flood risk in your area, whether your home has a basement, and maybe other factors. Rates for renters ("contents only" coverage) are much lower—in some cases, less than $100 per year. ValuePenguin offers a comparison of average flood insurance premiums by state in 2018. While this provides a general picture of flood insurance premiums nationwide, you'll need to contact an insurance agent to find out what the premium on your particular home in your particular area would be. How much protection does flood insurance provide? Maximum coverage for one- to four-family homes under the National Flood Insurance Program is $100,000 for contents (actual cash value) and $250,000 for buildings. Because these coverage limits are often less than the value of the home or its contents, policyholders might consider purchasing "excess" flood insurance to cover losses that exceed the limits of NFIP or Private Market Flood insurance. The NFIP doesn't sell excess coverage; if you are interested, ask your insurance agent about availability or a referral. I live in a high-risk area and received federal disaster assistance after my home was damaged in a flood. Do I have to purchase flood insurance now? Yes. If you live in a Special Flood Hazard Area (SFHA) and have received disaster assistance following a flood, you must purchase flood insurance and maintain it for as long as you own the property. If you sell, you have to inform the buyer about the requirement. If you are a renter and received FEMA assistance, you have to maintain flood insurance on your contents for as long as you live at the flood-damaged rental property. If you fail to obtain flood insurance, any future application for federal disaster assistance could be denied. Will my standard homeowners insurance cover water damage due to a broken water pipe, or would I need flood insurance? Virtually all home insurance policies cover plumbing leaks that are "sudden and accidental." In other words, you're covered for damage caused by a pipe that abruptly springs a leak (but not one than trickles out water over months or years). What if my flood damage is the result of a hurricane—will my standard homeowners or renters policy cover me? Standard homeowners and renters insurance doesn't cover flood damage, even if it is the result of a hurricane, and wind damage is covered by your policy. However, if wind damaged your roof, which resulted in rain entering your home, you might be covered under your standard policy. Talk to your insurer about your risk for hurricane damage and whether you should purchase flood insurance. Unlike flood insurance, mortgage lenders don't routinely require earthquake insurance, so it's really up to you to determine if the risk justifies the cost. Two major factors to consider are your risk level and, if you own the property, how much equity you have in the home. One feature of earthquake policies that deters some people from buying coverage is a high deductible compared to that of standard homeowners insurance. It is typically calculated as a percentage of the coverage limit (10-20 percent) rather than a dollar amount. Premiums, which are based on ZIP code, home age, number of stories, soil type, building materials, proximity to a fault, and other factors, are also relatively high. Of course, if your risk warrants it and/or going without coverage will keep you up at night, earthquake insurance might be worth buying even with the high premiums and deductibles. If you're in the market for earthquake insurance, start with your current insurer; the company may offer it as an add-on to your homeowners policy or as a stand-alone policy. In California, insurance companies are required to offer earthquake coverage, though the state also offers its residents coverage through the California Earthquake Authority. If your current insurer doesn't offer earthquake coverage, as for a referral. You can also contact your state's Department of Insurance for referrals. As with flood insurance, there are many variables that go into calculating an earthquake insurance premium. Generally speaking, premiums can range from as low as $400 per year into the thousands of dollars. If you live in a moderate-to-high-risk area, it's wise to get an estimate along with crucial policy features (deductibles, limits, etc.) and then make your decision. If you choose not to buy coverage, seismic retrofitting (strengthening your home against earthquake damage) could be a good use of your dollars. Learn more in the California Earthquake Authority's "Strengthen Your Home with Seismic Retrofitting," or do an internet search for keywords "seismic retrofitting" or "earthquake retrofitting." Learn more in NerdWallet's "Complete Guide to Buying Earthquake Insurance." Typically, it covers repairs to your home and other structures, replacement of personal belongings, and payment for additional living expenses if you can't live in your home. It won't cover flood damage, even if the flood is the result of the earthquake. And it won't cover fire damage resulting from the quake, but that would be covered under your regular homeowners or renters policy. Damage to your car would be paid for under the comprehensive coverage of your auto insurance. How do I know if my area has been declared a disaster? You will probably find out through local or national news reports. 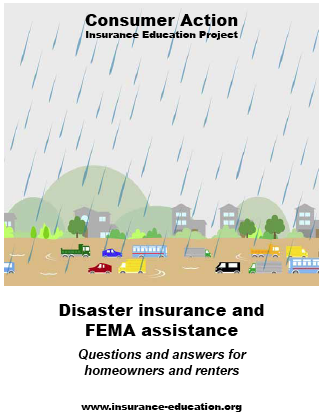 You can also find out at FEMA's "Disasters" webpage or by entering your ZIP code at https://www.disasterassistance.gov/get-assistance/address-lookup. Can I qualify for FEMA assistance if I'm not a citizen? If you request assistance on behalf of a qualifying child, all application documents, including ID, have to be under the child's name and Social Security number. To register with FEMA, call 800-621-FEMA (3362), visit www.DisasterAssistance.gov or visit a FEMA Disaster Recovery Center. How long does it take to get approved for assistance? You should get FEMA's decision approximately 10 days after your property inspection. If you are approved for assistance, the agency will pay you by direct deposit or check and will provide an explanation of what the payment covers. What is FEMA's property inspection process? If you don't have insurance, FEMA will contact you to schedule an inspection after you apply for assistance. If you have homeowners/renters insurance, you must first file a claim with your insurer and then provide FEMA with the insurer's decision letter (settlement or denial) before the agency will schedule an inspection. How much housing assistance does FEMA offer to homeowners and renters? Funds to rent a different home, up to the IHP maximum of $34,000. This assistance is provided for an initial period of one, two or three months, with the possibility of extending it up to a maximum of 18 months. A temporary housing unit (mobile home, manufactured home, etc.) for up to 18 months if rental properties are not available. This assistance is not counted toward the $34,000 IHP maximum award amount. Money for homeowners to repair disaster-related damage that is not covered by personal insurance. Funds are intended to make the home safe, sanitary and functional, not to return it to its pre-disaster condition. The maximum amount available is $34,000. Small Business Administration disaster loans. If more money is needed for repairs than is available as a FEMA grant, the homeowner can apply for a Personal Property Loan of up to $40,000 to repair or replace personal property and/or a Real Property Loan of up to $200,000 to repair or restore the homeowner's primary residence to its pre-disaster condition. Recipients of SBA loans must carry flood insurance for the life of the loan. Up to $34,000 to replace the home (only offered under limited conditions). More than one kind of assistance can be provided to a single household. The $34,000 limit includes all assistance—housing and "other needs"—to a household. What is "other needs" assistance? FEMA's Other Needs Assistance (ONA) program addresses specific needs created by the disaster, such as clothing, furniture, funeral expenses, childcare, emergency medical and/or dental help, and a range of other needs. What if I don't think FEMA has provided enough assistance? Do I have to repay FEMA, or pay taxes on the assistance I receive? You do not have to repay FEMA grants you receive because you were uninsured or underinsured at the time of the disaster. FEMA assistance you receive in the form of a low-interest SBA loan must be repaid according to the loan terms. FEMA assistance is not taxable income and does not affect benefits from any other federal program. What if my application for FEMA assistance is denied? You can appeal FEMA's determination that you are ineligible for assistance, in writing, within 60 days of the agency's decision. Be sure to read the letter you received explaining why your request was denied so that you understand the reason and can determine if you have a case. What should I do if my home has suffered damage in a disaster? FEMA offers a "Disaster Survivor's Checklist" (available in both English and Spanish) that will guide you through the key steps to take following a disaster. First on the list is calling your insurance agent(s). Second is registering with FEMA. It's important to contact your insurance agent(s) as soon as possible because insurance companies are inundated with claims after a disaster; you want to be near the top of the list. Even if you have insurance, register with FEMA for disaster assistance because the agency might offer different or additional financial assistance not offered by your policy. To register, call 800-621-FEMA (3362), visit www.DisasterAssistance.gov or visit a FEMA Disaster Recovery Center. How do I file a flood claim? FEMA offers a "What to Do After the Flood Fact Sheet" (available in both English and Spanish) that will guide you through the key steps to take following a flood. First on the list is calling your insurance agent(s) (homeowners/renters insurer and, if different, flood insurer) as soon as possible. You'll also want to register for disaster assistance through FEMA by calling 800-621-FEMA (3362), visiting www.DisasterAssistance.gov or visiting a FEMA Disaster Recovery Center. If a disaster has been declared, FEMA may have different or additional instructions for victims. Find out more at the agency's "Disasters" webpage. How do I file an earthquake claim? Contact your earthquake insurance provider to start your claim. If you have your homeowners/renters insurance through a different company, notify that agent too, since standard insurance sometimes covers damages that stem from an earthquake (say, from a related fire). If your car has suffered damage, file a separate claim with your auto insurer. Then prepare for the adjuster's visit and work through the settlement process. For more information, read United Policyholders' "Earthquake Claim Tips for Homeowners and Businesses." You'll also want to register with FEMA for disaster assistance by calling 800-621-FEMA (3362), visiting www.DisasterAssistance.gov or visiting a FEMA Disaster Recovery Center. The insurance check is made out to both me and my mortgage company—what's up? Mortgage agreements are written to protect the lender's collateral (your home). In a situation where your home is destroyed, having the insurance proceeds made out to both the lender and the homeowner prevents the homeowner from taking the money and running without rebuilding the home. Your insurer should release the money in "progress payments." According to Untied Policyholders, a typical progress payment schedule is to release one-third of the insurance proceeds right away (so that you can hire a contractor), one-third upon inspection verifying that 50 percent of the work is complete, and the remaining one-third upon verification that the construction is 100 percent complete. Learn more in "Getting Your Mortgage Company To Release Insurance Proceeds." Where can I learn more about homeowners/renters insurance? The non-profit United Policyholders advocates for insurance consumers and offers resources and information on its website. Your state's insurance regulator often has helpful information in print and online. Visit the National Association of Insurance Commissioners (NAIC) website to find your state's regulator. The industry-supported Insurance Information Institute offers free information to improve the public's understanding of insurance. Major insurance companies and online insurance vendors usually offer a variety of consumer education articles. One benefit of reading an insurance company's consumer or policyholder information is that you may get an idea of that company's policies regarding coverage and claims. Read your policy. This document is full of specifics about what is covered and what is not. Call your insurer or broker to ask general questions if you don't understand the coverage details. Where can I get advice about dealing with a particular disaster? United Policyholders maintains a Disaster Recovery Help page. From there, you can click on the image/link for the disaster you were a part of and be taken to a page that offers relevant information and resources (including, in some cases, a list of upcoming local workshops). The Consumer Financial Protection Bureau offers tips not regarding a particular disaster, but for dealing with some particular financial issues that can present themselves after any natural disaster. Read "9 financial problems after a natural disaster—and what you can do about them" to become aware of the challenges you might face and how to deal with them. I'm unhappy with how my insurance company has dealt with my claim. Do I have any recourse? If you believe an insurance company has treated you unfairly (acted in "bad faith"), you can contact your state's department of insurance to file a complaint and/or find out more about your options. You might also consider consulting an attorney specializing in insurance to find out if you have a case—many states have laws that require insurers to treat consumers fairly. You can find an attorney who specializes in insurance under the "Find Help" tab at the United Policyholders website. You can find an attorney who specializes in consumer issues at the National Association of Consumer Advocates website. You can also visit the American Bar Association online to search for your local bar association and attorney listings. To avoid dissatisfaction in the future, read United Policyholders' "Speak UP: How to communicate with your insurance company" and Consumer Action's "How to Complain" for guidance and tips to help you get the results you want. I am aware of someone committing insurance fraud—whom do I notify? You can report insurance fraud to your own insurer, your state's department of insurance and the National Insurance Crime Bureau (NICB) (800-TEL-NICB [835-6422]). I am aware of someone impersonating a FEMA official—whom do I notify? Report FEMA-related fraud to the Disaster Fraud Hotline (866-720-5721).